Die folgende Beschreibung ist eine automatische Uebersetzung von Sant Jordi Alberg ist nahe Gaudis Architektur am Passeig de Gràcia und der Rambla, der Kathedrale von Barcelona und das Nachtleben von Barri Gòtic entfernt. 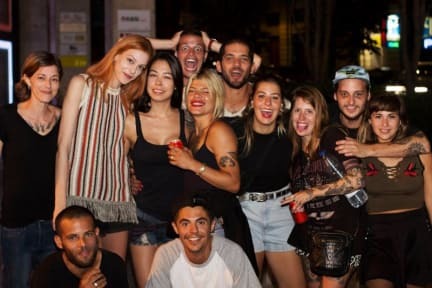 Hostelworld Gäste haben gesagt, das ist ein großartiger Ort zu bleiben, wenn Sie schauen, um Menschen und Party in Barcelona treffen. Unsere Kritiker haben es für Alleinreisende zu empfehlen, weil "es ist mehr ein Familienhaus als eine Jugendherberge, wirklich: bei jedem auftreten einander kennen, die Atmosphäre ist super und in der Nachtzeit die Partei bricht los. Best place to be in Barcelona :D Amazing atmosphere, nice dinner every evening (if you want to, just an option) and nice staff. Its really a place to feel home at. Toni, best men! This hostel isfucking amazing, really cheap, in the center of the city with a lot of shops around, free entry for clubs every single night, always nice people to chat and party with and a staff u would never dreamed of(relaxed, fun, they played drinking games with u and listen to really good music) especially Toni the most chilled guy I met so far in Barcelona, renatto as well! And gerado should open his own restaurant because of his cooking skills, will ever come back there again! You want to meet many new cool people? Stay at Sant Jordis! You can discover the city at day time and go partying in the evening. Einziger Mangel ist, dass das Bett etwas durchgelegen ist, ansonsten sehr empfehlenswert!! Besonders lustig war das Fortgehen mit einer großen Gruppe, da sich alle 4 Sant Jordi Hostels treffen. Die Gruppe wird bei den Securities dann auch einfach durchgewunken. Meine Freundin und ich haben im Hostel viele nette Leute kennengelernt und auch das sehr gute Abendessen um 4 Euro genossen. Wir würden jedenfalls wieder dort nächtigen. It was a great stay in the hostal, staff is friendly and its very easy to meet new people, as there is a nice common area,where people can meet each other and in the evening they host pub crawls. The location is perfect, there is a gym downstairs and a supermarket in front of the hostel. Can truly recommend the place. The hostel was great even for staying for a whole week in Barcelona. Great hostel for solo travellers. Every evening guided party tours. Good location, everything within walking distance. Could be a bit cleaner and more modern specially the facilities. Would stay there again. 2 showers for all men in the whole hostel is way too few. Also, way too few toilets. The showers were dirty and didnt work very well. The staff was nice, nothing too special though. Common rooms were rather small. The lockers are very big and you dont need an extra lock. I could not sleep well, because there was constantly an AC buzzing. (In my or the adjectant room). Our room had no windows. The emergency light was so bright, I had to put something over my eyes to sleep. The water in the shower was very thin and it smelled like mold. And the breakfast was later than announced. (So we couldn't use it, because we had a thight schedule). The rest was ok. Easy to reach spot. Good public rooms. Good prices. Friendly staff. Die folgende Beschreibung ist eine automatische Uebersetzung von Ich würde sagen, das, was bringt uns vor dem Rest ist unsere einzigartige Lage; Wir sind sehr nah an zwei der berühmten Gaudí Gebäude- La Casa Batlló und La Pedrera - und dem Gotischen Viertel. Ein lokaler Platz, den ich besonders empfehlen ist Aufgabe i Vins Restaurant ... es ist ein toller Ort für Paella und Sangria gut. Für Spaß rund um die Herberge Gäste spielen in der Regel ein paar Trinkspiele oder gehen Sie auf unsere kostenlose Kneipentour. Sie scheinen auch zu unserem Hostel Abendessen genießen!